Would you like to know how toric wearers really feel about their contact lens experience? How long it really takes misoriented toric lenses to recover? What % of toric wearers need to manually reorient their lenses? And how and when they do it? How much toric contact lens wearers are willing to pay for a better lens experience? 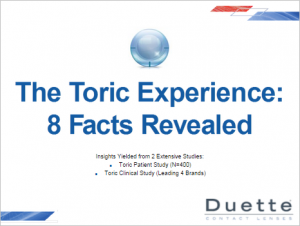 The Toric Experience: 8 Facts Revealed provides insights from two extensive market research studies, and shares feedback from independent eye care professionals as well.